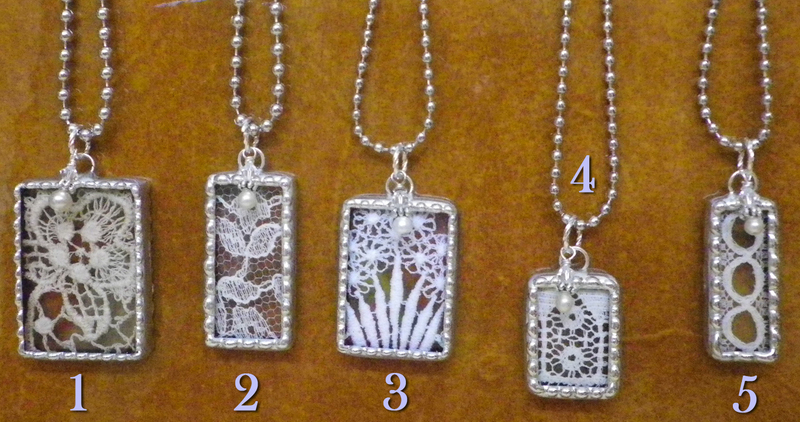 This is what the charms look like after being trimmed to fit the glass, and then wrapped in copper tape. 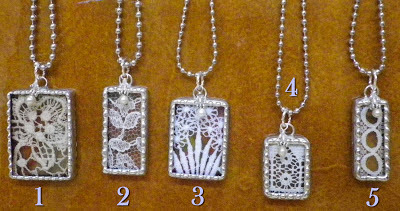 I wanted to make a nice variety, so there is a range of colors, lace types, and charm sizes to choose from. I've written to the winner, Laurie, and wanted to post the picture here, in case it would be clearer for her to view on the blog. I wonder which one she'll choose?? Thanks, Sandie! So glad you love it. I have another one like it, with those tiny little enameled flowers and nest, in my etsy shop right now. These are gorgeous and so clever! Thanks, Stasa Lynn. So glad you stopped by! I love 1,2, and 3! However, they are all beautiful!! Great job! They are lovely and she is one lucky lady. Did you just add extra sauder to form the dots? I do some stained glass work every now and then but nothing as clean or gorgious as this. Thanks so much! Yes, after the whole piece is soldered smoothly, I go back in and add little extra daubs of solder to get this effect. I like the way you add the little dots of solder around the edges. I played around with soldering for a while and have to say it is even harder than it looks - at least for me! #3 looks like it is made using that coronation cord technique I blogged about the other day. Will be hard for the lucky winner to choose, each one is lovely. Thanks for stopping by my special valentine post. Any charm that is chosen is lovely! Congratulations to your winners. or touch of your button. It can be accurate to mention the cinematographers these two films, Subroto Mitra, were people who most influenced my decision to turn into a cinematographer. Choose dining chairs based on how they search and function. care they require because the dogs have decided for adoption. You haven't any background info, no data for the mother, the planet from where it originated from with no thought of anything resembling, really. There a variety of Dachshund Puppies for Sale around, but taking some time to seek out quality breeders and quality puppies may go an extended way. teeth and also identified the social status of the owner. initially used by primitives by trying out fire. I'd moved in the evening difficulties of my past and was starting over. The arrival of recent artists, continuing development of tattoo pigments, along with the improvement from the equipments, made tattoos more fashionable. The Hawaiian tribal tattoos provide the Polynesian cultures that contain basic and curvilinear shapes. Shameless Plug: Go Get this BAG!